Choice boats for rent in northeast Vermont at boat dealers, rental centers, outdoor stores, and boat rental agent locations offering a variety of watercraft for rent. Find pontoon boats, fishing boats, family boats, canoes and kayaks, plus deck, ski and speed boats for rent in northern and eastern Vermont. Listed below find boat rental dealers and other resources offering boats for rent for use on Island Pond, Lake Memphremagog, Lake Willoughby, Maidstone Lake, Seymour Lake, Barton River, Clyde River and other waterways in Vermont. Rental locations are listed nearby cities and attractions. Cities listed include Montpelier, Morrisville, Newport, Barre and Lyndonville. Contact these boat rental services to see if they have the ideal boat for you to rent. Locate boat rental dealers and other boat rental locations within or nearby cities and attractions in Northern and Eastern Vermont. If you are looking for a specific type boat for rent, chances are one of these dealers can assist you. Boats offered for rent typically include canoes, family boats, pontoon boats, fishing boats, inflatables, jon boats, ski boats, aluminum boats, electric boats, jet skis and others. Some boats offered are confined to specific lakes while others are available for travel to other bodies of water. To enhance your boat renting experience, click here to locate resources for safety equipment, water toys and boating gear in Northeast Vermont. Find the ideal rental boat to fit your specific boating needs. Having the right boat can greatly enhance your experience on the water as well as impact safety issues. Some marinas may offer boat rentals for use on the lake where the marina is located. Check with Barton Landing, Newport Marine Services or The Marina at East Side for information on local boat rental options and recommendations. 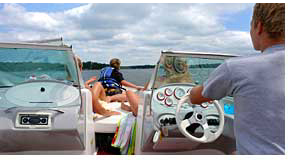 Pontoon boats are ideal for large groups or when taking small children boating. Most often they have a safety railing and a canvas or metal top to reduce the amount of sun rays absorbed by passengers. Runabouts are great for families and small groups to go sight seeing and cruising the lakes. Ski boats and speed boats are well suited for of three to five who enjoy water sports such as water skiing and wave boarding. Aluminum boat rentals are best suited for parties of one to four planning to travel short to mid-range distances. Bass boats are designed for two passengers and are ideal for most fresh-water fishing, and some inshore fishing. Lake boat rental...find a boat to rent and take the family and friends out on the water for a day of making memories. Before boating, become familiar with local boating laws and regulations. Check with your insurance agent to be certain you are covered while boating in a rental boat. Find boat rentals in other states.